A kitchen like no other, Mr Todiwala's Kitchen carries the name of one of Britain's most unique and characterful chefs, Cyrus Todiwala. When a famous chef critic said that Cyrus Todiwala "Lifts Indian Cuisine", he must have been referring to the scale of Cyrus' ambition. A dyed in the wool Parsee, born in Bombay, husband to Pervin, father of two great sons and recipient of a bucket full of prestigious awards, this is one lauded chef who won't stop working in the kitchen. Not till, perhaps, more people know about the joyful sophistication of Parsee cuisine, or why it's so important to support local producers, our future environment and the concept of food and hospitality as a great career. He's already changed perceptions of Indian cuisine since his arrival in the UK from Goa in 1991, where he was Executive Chef at the Taj. His influence on Indian cooking is seen and felt in many places beyond London. Indeed, Cyrus has achieved many things. With Pervin, he transfomed Cafe Spice Namaste, his bastion in the city, into a world renowned culinary institution. He's one of the only Indian chefs in the Who's Who and amoung others he's won a Catey award, a speical award from the Craft guild of Chefs, and various citations for his commitment to sustainability. In 2012 he cooked the very first luncheon of Her Majesty The Queen's Diamond Jubilee Tour. He's regularly on radio, television, including BBC1's Saturday Kitchen and the Radio 4 Food Programme. He's also written three cookbooks. Mr Todiwala's Kitchen in the culmination of Cyrus' lifelong dream, shared as always with Pervin and his two sons, not to mention the loyal team who have chosen to stick with them throughout the years. To see one's name on the door of a great restaurant. Now that really means something. 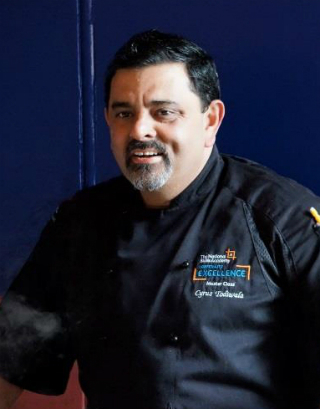 It takes strong leadership to keep a team inspired and focussed, and for over 20 years Cyrus & Pervin Todiwala have been one of the UK restaurant industry's most enduring double acts, leading the loyal team behind the sucess of Cafe Spice Namaste in the city. Now with Mr Todiwala's Kitchen, Cyrus & Pervin have transported their standards of culinary and service excellence to West London, backed by a dynamic knowledgeable front of house and kitchen brigade. While Cyrus' face and accomplishments as a chef, restauranteur and educationist are well known to many. Pervin keeps a low profile, but that's changing. Still how many people know that she graduated with a silver medal from Bombay's prestigious Institute of Hotel Management, Catering Technology & Applied Nutrition (IMHCT)? 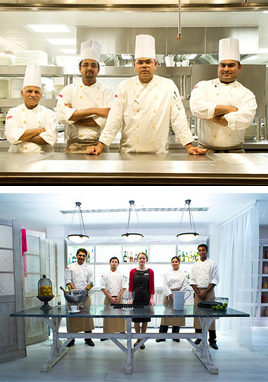 That she specialised in gard manager and butchery as a Chef de Partie at the Taj Mahal Intercontinental Hotel? That she has won awards for her front of house flair and was named by Tandoori Magazine as a "Woman on Top"? And she'as also PR and marketing savvy, hatching with her team many of the more innovative promotions to come out of Cafe Spice Namaste and Mr Todiwala's Kitchen. And do you wonder why before Cyrus agrees to anything he always asks you to "Ask the Boss"? Mrs Todiwala's right there next to Mr Todiwala in their shared kitchen! Mr Todiwala's Kitchen brims with all the ingredients of a great restaurant; fresh produce, unique recipes, and the talent and discipline to bring it all together. Teamwork, in other words. When Cyrus Todiwala was selecting staff for his first and only eponymous kitchen, he looked for the kind of people who enjoyed working as a team, whom others liked to learn from and be around. People with warmth, a bit of soul and most importantly, the nature to please. Because it's not just about the cooking and the serving. It's also about that first hello, and the keeness to provide customers with that longed for experience of fine Indian Food. 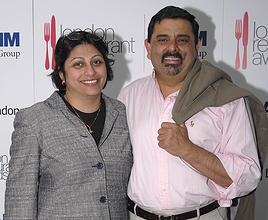 At Mr Todiwala's Kitchen, our team's cooking because of you.